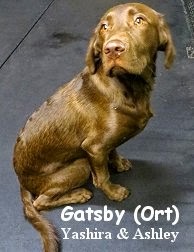 Early this morn we assessed Gatsby. He is a six month old, forty-five pound, energy-filled, Chocolate Labrador Retriever/Chesapeake Bay Retriever Mix. When Gatsby entered Fort Fido's lobby, we wasted no time getting him to the Big Roll Play Area. Once inside, he was a bit confused as to why he was here... After his owner left, Gatsby settled down into his new surroundings. He took the time to meet with Jackson, then quickly met Zipper, and others, as the pack grew. In total, it took probably five minutes for Gatsby to go from "unsure", to playing and having a blast. It was a sight to see and made us all happy. It's always a compliment to us,when a new-to-The Fort canine, is comfortable enough to play here within minutes of their arrival. It's just all around good, because that is what they are here to do, socialize, play, and enjoy themselves. We believe that Gatsby will continue to thrive here, and we look forward to having him in again. I sure hope he sleeps good tonight, or is at least "down a notch" cause he sure played whole-heartedly. Clips from today's BIG ROLL! Just a quick reminder... Harbor Hounds!